This massive book clocks in at 126 pages of content, 1 page front cover, 2 pages of editorial, 2 pages of ToC, 4 pages of SRD, 1 page backer-thanks, 3 pages of advertisement, leaving us with 113 pages of content, so let’s take a look, shall we? But first, before we do, let me mention something: This massive book is basically a compilation of material I have already reviewed…at least, for the most part: We have the lycanthrope-archetypes, the wereblooded races, the skindancers and the excellent advice/rules-book on actually playing lycanthropes and how to handle them in your campaign – I have already covered, in extensive detail, mind you, all of these pdfs, so in case you require an in-depth analysis, I’ll just point you there. 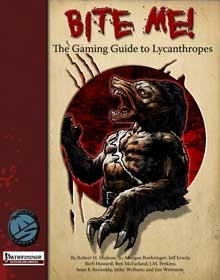 The book begins with a nice introduction to the subject matter by Ann Dupuis before venturing forth into the chapter on playing lycanthropes – which still remains one of the most useful components for a GM or player contemplating the use of lycanthropes in the game – the section is absolutely glorious and exceedingly useful. The section on archetypes is still solid – the archetypes provided cover most classes and add an option to spice your character up with lycanthropic options. The archetypes are mostly solid, though e.g. the cleric one may be a bit problematic. Still, an overall nice section. The wereblooded get some significant expansion, with Mike Welham providing no less than 7 new minor wereblooded clans. Charchardons get a 1d3 bite attack, can smell blood, hold their breath longer and get +2 to Swim. Chiroptera can lick weapons to make them cause bleed-damage, get +2 saves vs. ingested poisons and diseases as well as becoming nauseated/sickened; they also get +2 to perception and slightly reduce miss-chances granted by concealment as well as vestigial wings. Crocodylus wereblooded get +2 to Swim (and +2 to Stealth while swimming), an anti-trip vestigial tail, the same plague/disease-resistance and a 1d3 bite. Mantids get +4 Stealth in a certain terrain, +2 to saves versus mind-reading/charm/compulsions and vestigial wings. The Meles must take either +2 Con or Str and get a minor barbarian-like frenzy. The Rattus consider Escape Artist and Swim class skills, get the anti-plague/disease trick at double strength and can squeeze into smaller confines – nice one! Sinuae get +2 CMB for bull rushs and overruns while on the ground and 1d3 tusks. All in all, a solid array of complimentary clans here that further improve the already pretty cool wereblooded material! The skindancers remain an intriguing alternate race that has some downright glorious potential, but at the same time, they should be considered the most breakable component herein that has some obvious potential for issues; I’d suggest only experienced groups take this one and only once both player and GM have talked about balancing the character properly. Still, the narrative potential makes these guys interesting indeed and they make for truly superb villains with some powerful, evil options. Now if all of this does not (yet) sound like too much, then you’ll be happy to note that this book, more so than its component parts, acts pretty much as a kind of NPC-codex, with quite a few intriguing NPC-builds provided for the options contained within – with most of them even featuring their own artworks! If you’re a fan of well-written fiction, you most certainly will also appreciate the short story “The Duke’s Tramp”, provided by Dave Gross at the end of this book. Editing and formatting are excellent, particularly considering the length of this book. Layout adheres to Misfit Studios’ elegant and relatively printer-friendly two-column full-color standard with ample artworks. Additionally, a more printer-friendly version is provided – nice! The book comes fully bookmarked for your convenience with detailed, nested bookmarks and navigation etc. is simple indeed. Ann Dupuis, Robert H. Hudson Jr., Jeff Erwin, Rich Howard, J.M. Perkins, Mike Welham, Morgan Boehringer, Jim Wettstein, Ben McFarland, Dave Gross -note something? All of the authors accumulated herein tend to fare pretty well regarding their offerings; they are all talented people and this book does show that. The added amount of content that can be found within these pages most certainly makes the book even more useful and for the asking price, we indeed have a more than fair offering on our hands. While not perfect in every instance, we nevertheless get a massive, concise book on the subject matter that should be appreciated by anyone remotely interested in the material. While I would have loved for some potentially rough edges to be sanded off in comparison to the constituent pdfs, the added content does somewhat alleviate my gripes in that direction. Over all, this is a useful resource indeed and well worth a final verdict of 4.5 stars, rounded up to 5 for the purpose of this platform. You can get this interesting, well-crafted guide here on OBS and here on d20pfsrd.com’s shop!